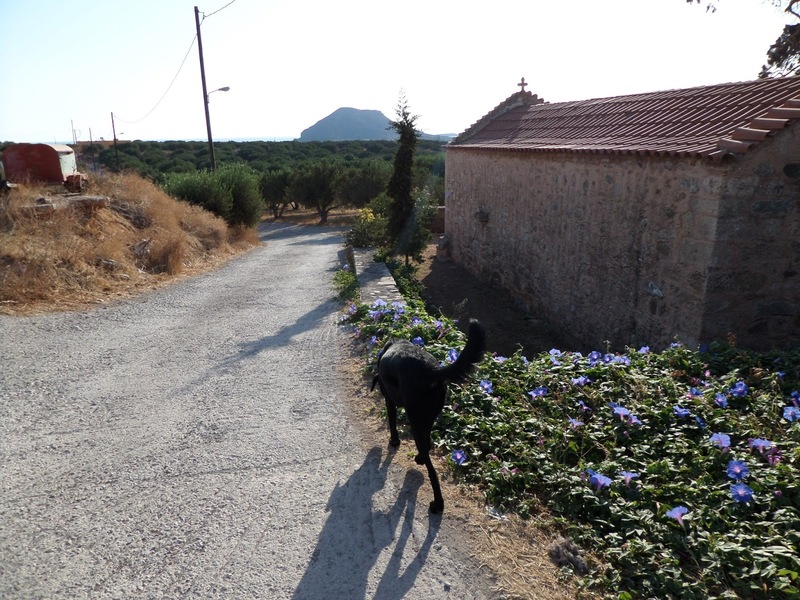 I don't mean to make you all jealous, but my morning dog walk here in Palaikastro is glorious. We have been going down to Kouremenos Beach from the village of Palaikastro every day for the last week. Some days we jog down, have a quick rest on the beach, and try to jog back up. Other days we amble, stop to sniff things, throw some sticks, have a swim, then amble home again. 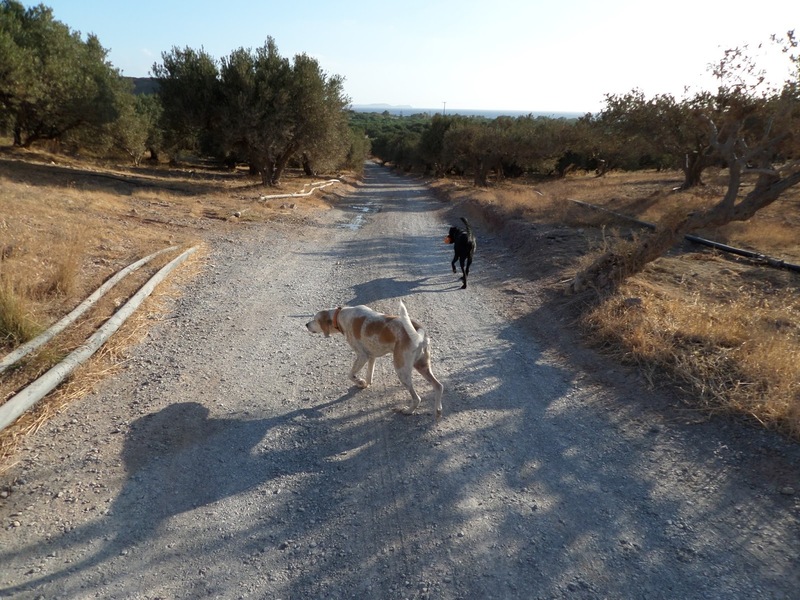 Sometimes we have company for our morning walk down through the olives, other times it's just the two of us. 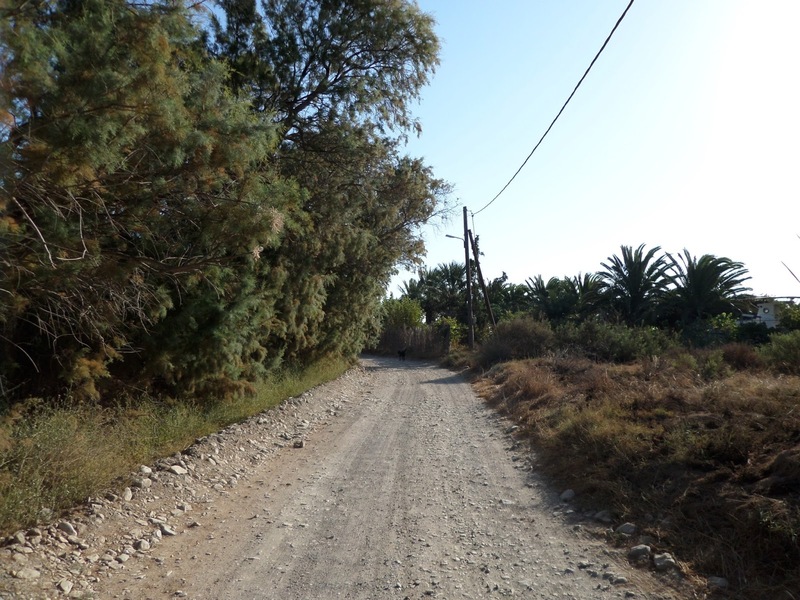 There are lots of great off-road walks in this area. 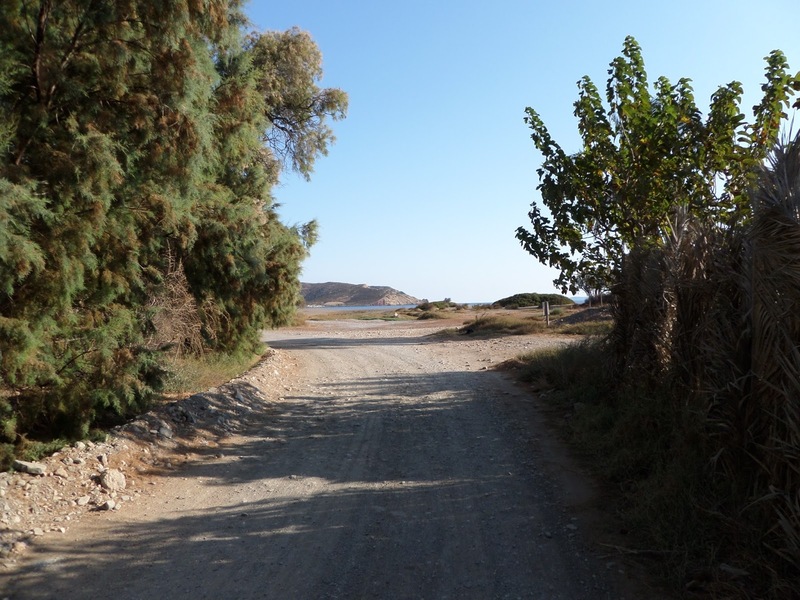 We turn down the dirt road by the small church of Agios Antonios (from the Palaikastro-Vai road, turn right at signposts for Hiona Beach, and turn left almost immediately onto the dirt road). Although there is something of a labyrinth of tracks criss-crossing the olive groves, it's hard to get lost when you have the beautiful Kastri mountain on the horizon, and glimpses of vivid blue sea. I love that this track, which only takes about 20 minutes at walking pace, passes first through olive groves, then through tall bamboo reeds, by tamarisk trees, and finally palms, before suddenly opening out in to the wide, sandy bay of Kouremenos. 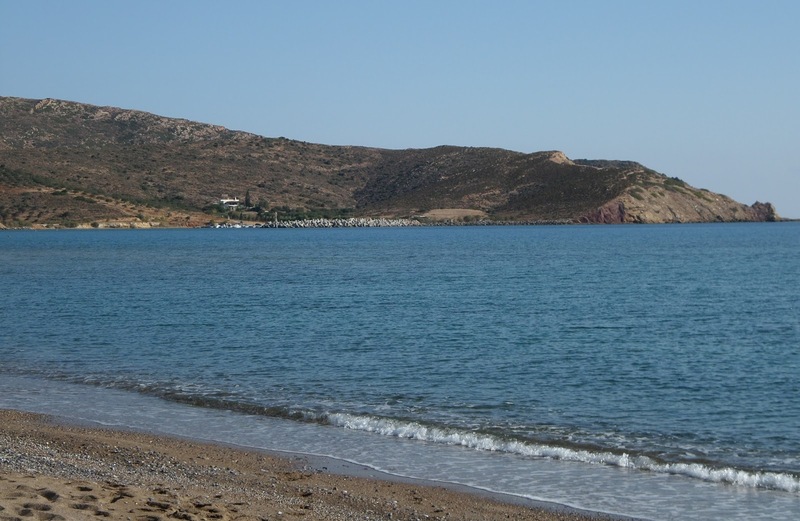 I haven't been there yet this year, but at the end of this beach, by the small harbour (mainly used by local fishermen), there is a great cantina, which opens from around Easter until October. 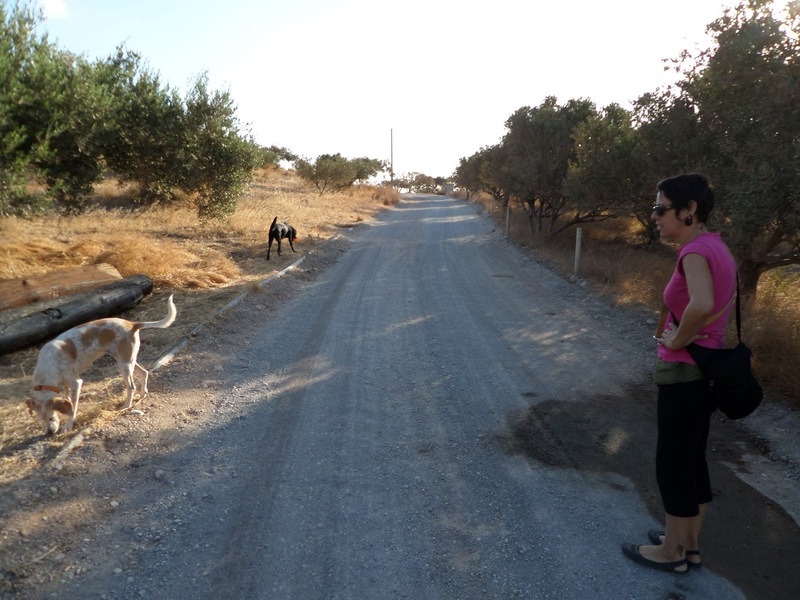 This is one of the best kept secrets of the area, if you like a dinner of barbecued meat and a simple salad, washed down with raki or beer. The owners of this place are wonderful, very welcoming to everybody, and had no problem with me bringing Sage along the last couple of years. Last year they told me they had just got a dog too. There are many other places to eat dinner around here, and many with more varied menus and fancier decor - the charm of this place is that it is so low-key, friendly, and cheap! Turning in the other direction, you will find a couple of windsurfing schools. I was really hoping to catch some of the campers this year before they headed back home; last year we met lots of tourists who had traveled with caravans from Italy, Belgium and France, with their dogs, to spend some time wind surfing at Kouremenos. Sadly, I arrived too late this year, and they had mostly already dispersed. 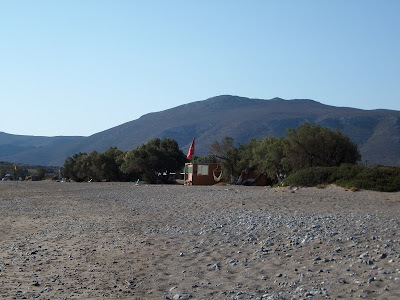 Usually, some tents are pitched on the beach under the trees towards Kastri, while caravaners set up home just behind the surf school, back from the beach. There is a new cafe/bar on the beach this year. I haven't been yet. Each year there is a little bit more development, but fortunately this area is still fairly peaceful and not choked up with hotels and bars. 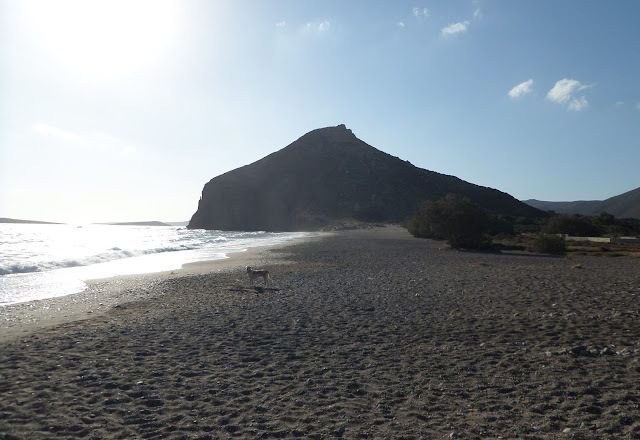 I should have probably said this first: I have been informed that there are "No Dogs" signs on the beach at Kouremenos. Honestly, I haven't seen them. It's true sometimes I pretend I haven't seen such signs (like on the next beach round at Hiona), but in this case, if they exist, they are at the far end of the beach closest to the newer fish tavernas and rent rooms, towards the small harbour. I believe this beach is long enough for everybody to enjoy it, windsurfers, families, and dog-owners alike.